In 1878 Adam Burke leaves Philadelphia for North Platte, Nebraska. The young lawyer wants to start a new life after being spurned by his fiancee. Adam also has another reason to leave -- he accidentally ran over and killed a woman named Nancy Mason in a thunderstorm. In North Platte he finds success in more ways than one when Rachel Mason answers his ad for a mail order bride. Adam considers the last name an odd coincidence -- but only after their marriage and after they both come to the Lord do they discover the awful truth: Adam killed Rachel's mother. Thanks to a pastor's intervention, Rachel overcomes her shock and bitterness to forgive Adam, just as God forgives us all. Al Lacy has written more than ninety novels, including the Angel of Mercy, Battles of Destiny, and Journeys of the Stranger series. He and his wife, JoAnna Lacy, are coauthors of the Mail Order Bride, Hannah of Fort Bridger, and Shadow of Liberty series. The Lacys make their home in the Colorado Rockies. 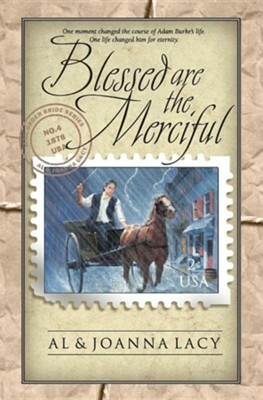 I'm the author/artist and I want to review Blessed Are the Merciful.